On 17 September 2014 the Bangladesh Supreme Court ruled on an appeal against the conviction and death sentence originally imposed on 28 February 2013 by the Bangladesh International Crimes Tribunal (“Tribunal”) on Maulana Allama Delwar Hossain Sayedee. Sayedee was originally convicted of eight charges of crimes against humanity and sentenced to death in respect of two of those charges. Immediately following the announcement of the verdict, accusations of political collusion and behind the scenes deals emerged. The ‘Ganajagaran Mancha’ pro-execution activists from the blamed the Government. The Government blamed the Prosecution. The Prosecution blamed the Investigators. It appears to be everyone’s fault. Even the Tribunal Judges have expressed their dismay at constantly being criticised for the failings of others and reminded the Prosecution that they are required to prove their case beyond reasonable doubt, not the judges. This is an interesting remark. One would think that if the Prosecution failed to establish the burden of proof an accused is entitled to an acquittal, not a mere reduction in sentence. If the Investigators and Prosecutors are so lacking in competence, as the Attorney General has suggested, then is it not the judges who at fault for not directing an acquittal, or at the very least, as the defence have repeatedly demanded, a full retrial before a competently assembled tribunal of law demonstrating the requisite independence and impartiality necessary to maintain fair trials. The Attorney General, as British journalist David Bergman has pointed out, has failed to consider his own failings, as it was his submissions to the Appellate Division of the Supreme Court that led them to reverse three convictions and commute the death sentence to a period of imprisonment. This is a time therefore to take a very serious look at this special brand of justice that the Government is weaving in Dhaka. The Prime Minster, Sheikh Hasina Wajed, not known for demonstrating restraint, expressed her regret that Sayedee would not be hung. This is supposedly a process, if we are to believe the Government, aimed at justice and reconciliation. It is difficult to see how such a statement contributes to either. The Prime Minister has assured us that the judges are independent and impartial and came to their decision independent of the Government, but this in reality is paying lip service. Two important questions emerge. First, has justice been done? Second, if not, who is to blame? In response to the first question it is to be noted that the full judgment of the Appellate Division of the Supreme Court is yet to be released and therefore any criticism of its findings will have to wait for some weeks as yet. It is clear that there will be a rigorous dissection of how the judges came to the present decision amidst such widespread allegations of prosecutorial and judicial misconduct, witness perjury, witness abduction, falsifying of evidence and governmental interference. The Supreme Vourt will also have to reconcile the very serious allegations made by the defence as to the impartiality of two of the panel of five Supreme Court Justices for demonstrating bias prior to the appeal being heard. The Awami League Government has declared that the verdict has been delivered by the highest court in the land and that no criticism may be levelled at the honourable justices. This is possibly one of the very notions that separates a functional democracy and judicial system like we have in the UK from the autocratic system in Bangladesh. It is not considered contemptuous or seditious to criticise the decisions of our Government or Judges. In fact it is a national pastime. As a lawyer I can say, and have said on numerous occasions, that the decisions of our courts at times defy logic. I can also challenge the decisions of our Courts and public bodies in the European Court of Human Rights in Strasbourg. I can criticise my Government and the Courts without fear of reprisal. In one recent matter where the Prime Minister commented on proceedings that were sub-judice, the phone hacking trial of Andy Coulson, he was heavily criticised by the trial judge. Such a situation only occurs in a functional and mature democracy. It would not occur in Bangladesh where the Courts would appear to have become an extended arm of the Executive. In most capital cases the commuting of a death sentence of one’s client is considered to be a success – particularly in such a volatile political environment built on blood and vengeance. However, whilst it is clear that a sigh of relief was shown immediately following the verdict, both for my client and the risk of ensuing instability, let us not forget that following Sayedee’s conviction by the Tribunal violence on the street ascended to an unprecedented level, the decision to sentence Sayedee to the rest of his natural life in prison clearly demonstrates the level of control the Government has over the Courts. The lives of the accused would appear to be literally in the Prime Minister’s hands. Let us not forget her words following the execution of Abdul Quader Mollah in December 2013. The UN Secretary General, Ban Ki Moon, and US Secretary of State, John Kerry, had both pleaded for her to show mercy, but she rebuffed all efforts. She is attributed as having stated publicly, some time after the conviction, that none other than the daughter of Bangabandhu had the courage to carry out the execution. She was quite emphatic in her valour. Sayedee, like most of the other accused, has been demonised as a war criminal that collaborated with the Pakistan Military. This is quite convenient as it allows the Government to peddle its rhetoric of fighting extremism and rebuilding a broken nation. In this regard it is convenient to forget the fact that the two charges upon which Sayedee was initially sentenced to death were based on the flimsiest of evidence. In fact there was no direct evidence was heard. Such a low standard would not have even satisfied the test of confirming an indictment before an international court, let alone to send a man to prison for the rest of his natural life. This entire process has been plagued with criticism from a number of legitimate and varied sources. 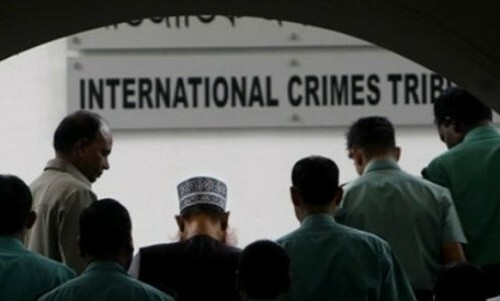 Whilst the Government of Bangladesh is at pains to convince the outside world that international standards are being maintained and that this process will serve as an example of justice for historical crimes before national courts, it is nothing short of a crime that the international community, most notably the United Nations, has remained silent. The Sayedee case epitomises the level of injustice that has just unfolded in many respects. A prosecution witness recanted his statement and was called as a defence witness. He was later abducted and tortured by Bangladesh law enforcement officials before being thrown over the border into India. The Chairman of the Tribunal was shamed into resigning after having embarked on numerous improper discussions with a Bangladeshi law professor in Belgium intent on seeing the defendant convicted and executed. Two members of the Supreme Court bench that heard the appeal had issued statements prior to the appeals that clearly demonstrated they lacked the requisite impartiality to sit in judgment. Prosecution witnesses were prepped by a group that has campaigned long for the Jamaat leaders to be summarily tried and executed. Prosecutors were instructed by a so-called advisor to the Chairman of the Tribunal. Pro-execution activists drafted orders and judgments for the judges. These are just some of the matters that have characterised the Sayedee trial, but we are expected to believe that it was conducted transparently and in accordance with the highest international standards. The criticisms have been referred to as procedural irregularities and part of an international conspiracy orchestrated by Jamaat lobbyists. One of the most curious relationships that has emerged is that of the former Chairman, Justice Nizamul Huq, and Dr. Ahmed Ziauddin, an international law expert based in Brussels. The two jurists were long standing friends. In December 2012, the Economist received a series of leaked emails and Skype recordings involving Nizamul Huq and Dr. Ahmed Ziauddin. The latter, the self-styled Director for Bangladesh Genocide Studies, had provided expert evidence in the form of reports for the prosecution in the Sayedee case. The Economist article revealed how Ziauddin had urged Huq to speed up the Sayedee trial, with the promise of swift promotion to the Supreme Court’s Appellate Division. In light of the publication, Huq was forced to resign. Despite the presiding judge’s resignation the trial continued with a replacement. This is startling, not simply because Skypegate had fatally damaged the credibility of the Tribunal, but as will be shown, the Sayedee trial was to be presided over by a panel of three judges none of whom had heard all of the evidence and yet were expected to make an impartial and informed decision. The infamy of the former Chairman was not limited to Skypegate. Prior to this there were serious allegations raised by the defence as to the appearance of impartiality. In the 1990s, Justice Nizamul Huq, had played an instrumental role in the People’s Inquiry Commission, an investigative body that conducted a war crimes inquiry. The findings of the inquiry were provided to a ‘People’s Court’, a public mock trial that culminated in death sentences for many of those persons now on trial. An application was filed by the defence team in the ICT, requesting Huq’s recusal given his previously involvement and therefore the clear inference of bias – this was refused. A further clear example of prosecutorial and investigative misconduct so as to influence the trial was highlighted on 10 April 2012. On 29 March 2012, the ICT passed an order that provided for 15 prosecution unsigned witness statements to be admitted into evidence without those witnesses being present to testify, on the basis that those witnesses were now either missing or in hiding because of threats made against them by agents of Sayedee. On 10 April 2012 the Amar Desh newspaper published an exposé demonstrating that three registers concerning a safe house had been obtained, which showed that some of those 15 witnesses were in fact in a prosecution provided safe house during the time in which the ICT was hearing testimony. Clear evidence therefore that it had in fact been the prosecution that had prevented the witnesses from attending court to give evidence, and thus denying the defence the opportunity to challenge their evidence. One of the fifteen witnesses was Shukhoronjon Bali. Bali had confirmed to the defence that his witness statement had been fabricated by those investigating the allegation and he refused to give the evidence contained within that statement. Bali confirmed that he would testify on behalf of the defence, not only to confirm that he had been available previously and that the statement had been fabricated, but also to testify that those persons who killed his brother in 1971 were members of the Pakistan army and not Sayedee. On arrival to the Tribunal to give that evidence, Bali was abducted by state law enforcement officials and vanished. Defence pleas to the Judges for assistance were rejected, and it later transpired that Bali had been detained, tortured, and then sent over the border into India where he was duly arrested and was currently detained in a prison facility there. Justice Huq was the Chairman of the Tribunal presiding over the Sayedee case. The criticisms of Justice Huq are well documented, in that it was clearly inappropriate for him to have been appointed in the first instance given his previous involvement in the People’s Inquiry Commission, and yet the controversy didn’t end there. Despite being clearly predisposed towards a guilty verdict and effectively allowing the Prosecution free reign, it wasn’t until ‘Skypegate’ that Huq was finally forced to resign. As much as this is concerning in isolation, it is perhaps of even more concern when we consider the position it left the trials in. Following Huq’s resignation, the trial was left without any of the original justices who had begun to hear evidence. Not one judge had heard the case from start to finish, and yet this was deemed to be acceptable procedure and the trial reached its conclusion. On 25 March 2010, the Tribunal was established with three Judges elected. The first bench of Judges consisted of Justice Nizamul Haque Nasim (Chairman); District Judge A K M Zahir Ahmed; and Justice ATM Fazle Kabir. The Registrar of the Tribunal was Md. Shahinur Islam, who established the infrastructure for the running of the court. The three Tribunal Judges at this Tribunal began to deal with the first wave of cases that included the first trial of Delewar Hossain Sayedee (ICT-BD Misc. Case No. 01 of 2011) in October 2011. On 22 March 2012 a second Tribunal was established consisting of Justice ATM Fazle Kabir (Chairman); Justice Obaidul Hasan; and Md. Shahinur Islam. Interestingly, the Chairman of the Second Tribunal was the same Justice ATM Fazle Kabir originally serving as a judge in the first Tribunal and currently hearing the case against Sayedee, which at the stage of his promotion was still at the stage of hearing the Prosecution evidence. The new judge appointed to replace Justice Kabir in the Sayedee trial was Justice Anwarul Haque. He joined the trial not having heard nearly all the Prosecution witnesses give evidence, so it would was an impossible task for him to convict an accused in these circumstances, as he could never be sure of the quality of the case against Sayedee. Later in August 2012 a further judge was removed. Justice AKM Zahir Ahmed resigned citing ill-health. Justice Jahangir Hossain Selim of the High Court was appointed to replace him. Justice Selim had not heard any of the prosecution case and only part of the defence case. The final nail in the coffin of justice came when Justice Huq was forced to step down in December 2012. This presented the Government with a serious dilemma. Not a single judge who started the trial and confirmed the indictment in the Sayedee case was left on the bench. To counter any criticism, the Government moved Justice ATM Fazle Kabir back from the Second Tribunal and appointed him Chairman of the First Tribunal. The defence argued that under such extraordinary circumstances the only recourse was a retrial. The Tribunal, and notably the Government, disagreed. The judges could simply rehear closing submissions. On 28 February 2013 Sayedee was convicted and sentenced to death. On 17 September 2014 his appeal was dismissed and his sentence of death was commuted to a term of imprisonment for the remainder of his natural life. The Supreme Court proceedings have also come under increasing scrutiny. In 2013 Mr. Justice Shamsuddin Manik Choudhury, a staunch advocate of hanging the accused, was appointed to the Appellate Division of the Supreme Court of Bangladesh. On 31 March 2013, the Chief Justice constituted a bench of the Appellate Division to hear the Appeal of Abdul Quader Mollah (whom we must remember was executed). Justice Choudhury was appointed to the bench to hear the appeals. Another member of the bench, Justice Sinha, was exposed during the Skypegate scandal of having promised the disgraced Chairman an elevated promotion to the Supreme Court if he convicted three of the accused by the end of the year. A defence application was filed against the two judges, Justices Sinha and Chowdhury, to be recused given the clear evidence of bias. Against Justice Choudhury it was alleged that in April 2010 he had attended a meeting with members of the Awami League during which they campaigned for the trial of the Jamaat leaders as war criminals. As per other petitions filed, the application was refused, despite clear procedural impropriety and bias. Sheikh Hasina, the Prime Minister of Bangladesh is at pains to suggest both domestically and to the world at large that the Tribunal is independent; that it is free from political influence; and yet, there have been numerous statements made that would suggest the complete opposite. As noted earlier, following the execution of Abdul Quader Mollah, Sheikh Hasina publicly declared that she had been put under significant pressure by the international community to commute the death sentence, yet her response to the public in Bangladesh that only she was strong enough to resist this pressure, and that only she was strong enough to execute Mollah. This contradicts statements that the judiciary is acting independently. The Awami League Government has consistently made wildly inappropriate comments about the trial, some of which may constitute incitement, and others which evidence the clear political motivation of the trials, and yet the laughable position is still maintained that politics has no part to play in the work of the Tribunal. The question however, is why; given the previous cases before the courts, and given the courts previous reluctance to adhere to any recognised rules of evidence or procedure, the court should allow an appeal in part and commute the death penalty. If the evidence was so weak as is the defence position then the accused should be acquitted and not just a reduction in sentence. We can only surmise as to the courts reasons from moving away from its prior pre-determined practices, however, I would offer a possible explanation. In dealing with any case before a court or group of cases, it would ordinarily sound absurd to characterise the Sayedee trial as ‘the most flawed’, however, with the Tribunal, all of the cases are absurd, and it is merely a question of degree. The Sayedee trial can be given this dubious mantle for two reasons. The first being that for at least one of the crimes for which he stood trial, the central prosecution witness who made the complaint of murder was not even called to give evidence by the prosecution despite her being known, and available to be present. This witness is important insofar as although Sayedee was charged and then convicted of the murder of members of her family, when she made her original complaint she named the individuals responsible, and Sayedee was not one of them. The second reason, as already mentioned, is that a central defence witness who was originally a prosecution witness but had recanted his statement, was abducted by the Bangladeshi security services from the steps outside the court, held in custody for weeks, tortured, and then deposited over the border in India where he was duly arrested and imprisoned and where he remains to this day. This witness was to give evidence in support of Sayedee. Damning evidence indeed. Like all the cases before the Tribunal, the trial and subsequent judgment were internationally condemned due to the established and widely reported levels of judicial and prosecutorial misconduct and persistent intervention by the Government of Bangladesh to ensure convictions. The concerns regarding the tribunal and the Awami League Government’s attitude towards opposition supporters have been shared by the European Parliament in their resolution of the 18 September 2014 wherein they re-asserted their concerns about persistent clear human rights abuses. The resolution also states that “whereas there is strong and repeated criticism that the ICT does not comply with international standards (para. N)”, going on to note that it “welcomes the Supreme Court decision of 17 September 2014 to commute the death sentence handed down by the International Crimes Tribunal to [Sayedee] to life imprisonment”. Contrary to the suggestions of the Government of Bangladesh, the resolution further stated that it “emphasises the importance of an independent and impartial and accessible judicial system to enhance respect for the rule of law and for the fundamental rights of the population, and of reforming the international crimes tribunal”. This is by no means an endorsement as it recognises the need to reform the process. Why then has the Supreme Court commuted the death sentence, is it because the Supreme Court has taken on board the comments made internationally regarding the inadequacies of the Tribunal and the processes adopted, or is it for another, more political reason? I would seek to suggest the latter, in that the appeal was allowed in part so the courts, and the government can suggest that the process is fair, and that any incorrect decision is in fact corrected on appeal, thus seeking to give the process an air of legitimacy. The decision is nothing more than a thinly veiled attempt at changing the focus from the inadequacies of what is essentially a process that has become a political tool, one which is being used to undermine the political opposition rather than actually seeking to offer justice to the victims and seeking to address the wrongs of the past. The Government and the Judiciary cannot however change the fact that there have been a plethora of problems with all of the trials, problems that have been reported in Bangladesh and the international press. Problems that have been seized upon by the Economist, Human Rights Watch, and by some of the most respected experts on international law across the globe. This decision does nothing more than add more weight to the argument that the trials must be immediately halted. The trial process is not fair, it is not impartial, and it does not offer justice. The appellate process would appear to be simply an extension of an arm of government as are the lower courts. The only way in which Bangladesh can seek to address the crimes of the past and address those ghosts that still haunt the people of Bangladesh, is to order a fully independent and impartial tribunal, with full international oversight and focus on a long term transitional justice strategy. During the Prime Minister’s recent address last month at the UN General Assembly in New York there was a call for international support of this process. There should be international support, not in the way the PM envisages, but by putting this back on the agenda of the United Nations to discuss the mechanism by which justice may be established in Bangladesh.